The mirror scanned my face. It saw what was wrong. Panasonic has discovered a profitable new business in the last few years: beauty tech products. Facial moisturizing tech, hair dryers and very relaxing eye masks that I may have tested out (multiple times) at my local Japanese tech store. 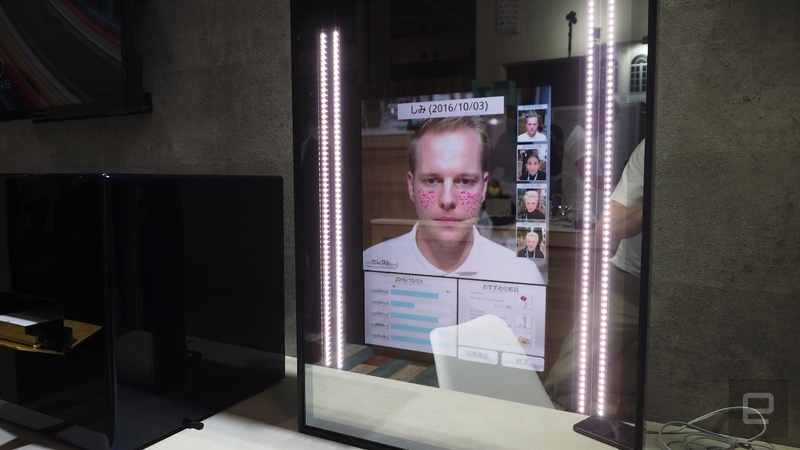 This time, the tech giant pitched its latest beauty concept as an "interactive mirror." Same old story, right? Not quite. It says it could be a makeup-applying "revolution" that scans your face, decides what needs a little cosmetic help and prints a combination pad of foundation and concealer to fix it up, with little to no makeup wasted. It sounds like a nonsensically vague future concept, but Panasonic thinks otherwise, and has the demo to prove it. First, there are some caveats. 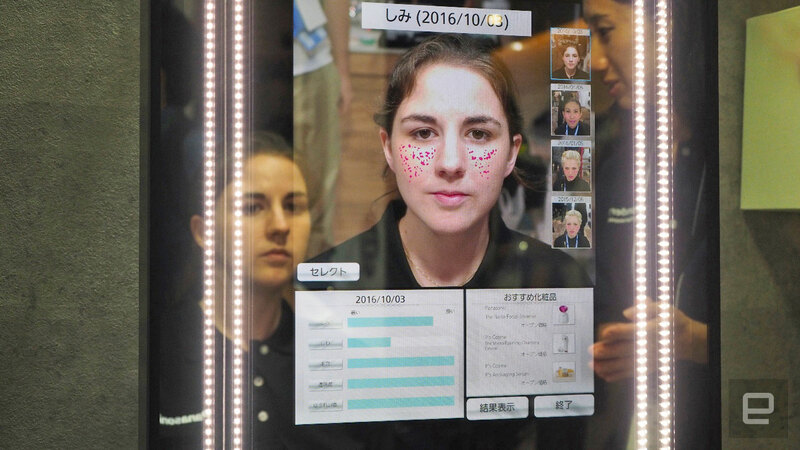 Buried away in Panasonic's concept booth at CEATEC here in Japan, the company had its face and skin-analyzing smart mirror (as we saw back in January) set up to detect skin blemishes (sun damage, spots, wrinkles and more). 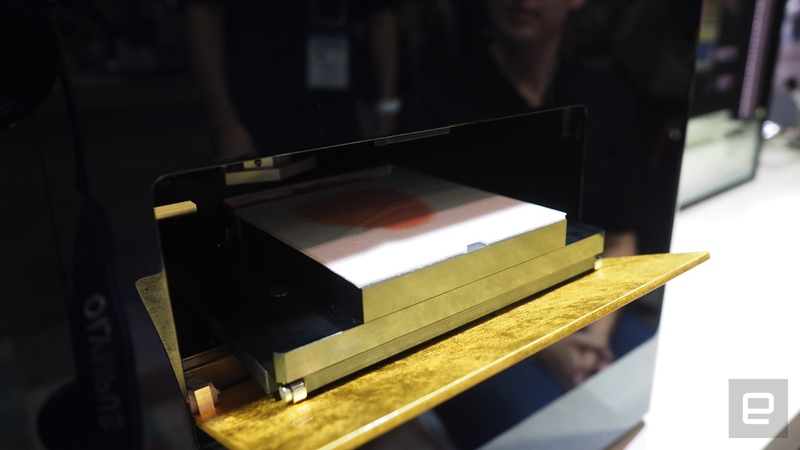 The mirror then delivers that data to a makeup printer that spits out a sliver of makeup (matched to your own skin tone) in roughly two minutes. It's not instant, and at this early stage the company says the printed patches also take roughly a day to dry and settle before they can be applied to a person's face. Once that's happened -- the company had extra pre-printed patches aside for testing -- the makeup layer is placed on a cheekbone mask sprayed with water and gently smoothed out. The user (or their makeup artist?) then lightly presses this onto their cheek, leaving the thin layer of makeup behind. A few moments later, the water has evaporated and you're left with a kind-of temporary tattoo. That's apparently what it feels like at first, but it becomes more natural as you get used to wearing it. 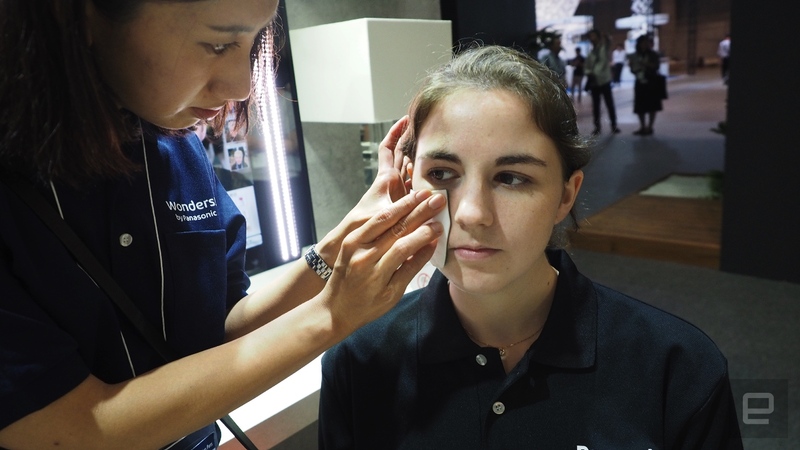 Despite being offered the chance to test it out, with three-day scruff (and a lack of experience with makeup), I opted to have Panasonic employee Caitlin test in my stead. However, I did get to test out the skin analysis component. Computers can be cruel. Compared to Caitlin, the mirror singled out my open pores and crows' feet although I apparently don't have much UV damage or aging spots. So that's good, I guess? The product is still in the prototype phase, but Panasonic hopes to keep its beauty division at the cutting edge. A spokeswoman explained that the machine could be used to cover scar tissue and even tattoos. The makeup printer is currently only able to conceal skin blemishes, but the company is looking into wrinkle reduction and more.